We get a lot of "google hits" for Mine Falls Park in Nashua. If you're not familiar with the parking and entrances, it can be a tad confusing. So consider this my attempt to make the information about MF more accessible. 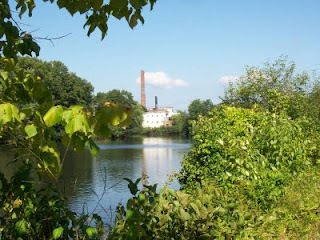 For those who don't know, Mine Falls is a 325-acre walking, jogging, and biking park between the Nashua Canal and Nashua River. I've included links to some maps below. The first link is a drawn-to-scale scale map showing all of the park's trails, although it doesn't list trail names. To be honest, the trail names are not all that important. You really can't get lost here if you stick to the trails since they all loop around. We rode Mine Falls today for a little over an hour. We parked at the end of Whipple Street, started out going west on the yellow trail, passed under the turnpike (this part is really noisy) and then followed the green trail to the gatehouse and dam. Retracing our steps, we returned to our starting point and then headed east on the blue trail that took us behind the Millyard (shown above) in downtown Nashua. Doug says the park seems to "shrink" each time he rides it. That's probably because he's getting more familiar with it! The second link is a map (not drawn to scale), that has a description of each of the seven entrances. This map is helpful if you want a general overview and points of reference. So there you have it. I wrote a longer post about Biking Mine Falls Park last year. If you're a newbie to the area, you might find some useful tidbits there. Happy biking! We were with a large group of kayakers when we stopped to take a break on this sandy beach after nearly three hours of paddling. If you're interested, you can read more about Lehtinen Park in Concord, accessible from the Contoocook River. Yes, we love New Hampshire, but we're also partial to the neighboring state of Maine. In fact, we're headed to Long Island, Maine on vacation. (Year round population: 200; Summer population: 700.) We're not taking our kayaks or our car -- the island is only 1 mile wide by 3 miles long -- but we are taking our bikes. 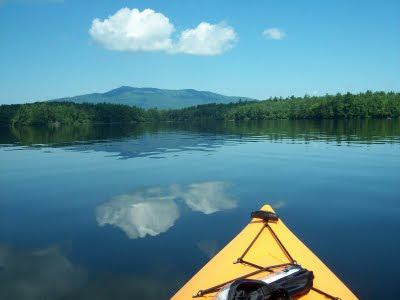 Before we unplug for a week, I thought I'd leave you with a list of cool ways to spend a summer day in New Hampshire. Aim for early morning, if you can. That's when you're more likely to see loons, bald eagles, beavers, and other wildlife. In the afternoon, visit nearby Lost River Gorge, where the brave-hearted are welcome to venture into cool, dark caves to see what they can see. You can read about our trip to Long Pond in 2007 here. Would love to make a return trip! We're going to visit a rock, you ask? Well, this isn't just any rock; it's the largest erratic boulder in New England. We guarantee it's more impressive in size than the famed Plymouth Rock in Massachusetts. To see for yourself, check out fellow New Hampshire blogger J.W. Ocker's video of his trip to the rock. (I love his site, O.T.I.S, which stands for "Odd Things I've Seen." ) Follow your stop at the rock with an afternoon at nearby White Lake State Park, where you can enjoy a refreshing swim under a canopy of pine trees. 3. Take a bike ride around Strafford-Bow Lake. 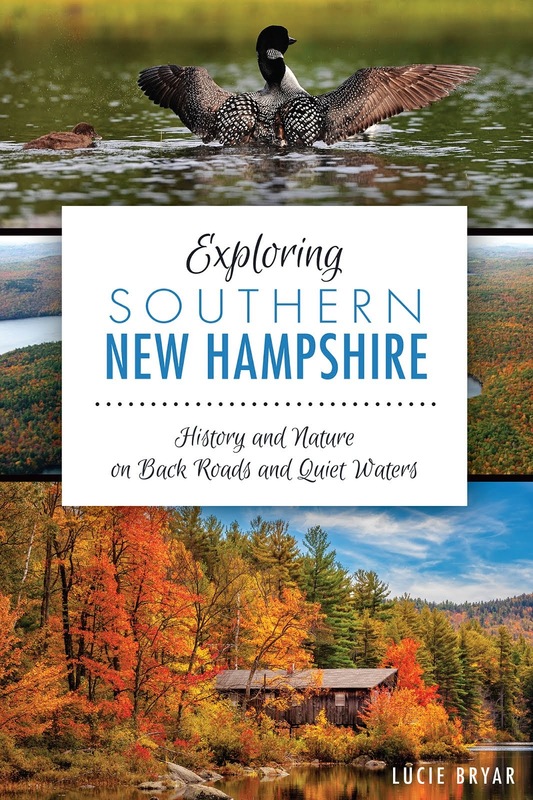 In her book, Bicycling Southern New Hampshire, Linda Chestney describes it as the "perfect family ride." There's little traffic and you'll be able to experience some of New Hampshire's simple allure: "stone walls, large maples, birches, tree-canopied roads, and old burial grounds." Add a place for picnicking and swimming at the end of the ride and what more could you ask for? 4. Kayak (or canoe) the Connecticut River between New Hampshire and Vermont. 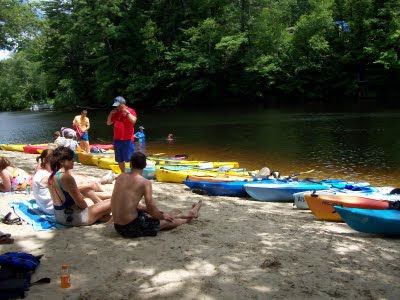 If you're looking for peaceful and scenic flatwater paddling, check out North Star Canoe Rentals in Cornish for shuttle and trip information. You'll paddle beneath the Cornish-Windsor Covered Bridge (the longest wooden covered bridge in the United States) while enjoying views of Mount Ascutney. This one's on my wish list. 5. Hike Mount Willard for great views of Crawford Notch. 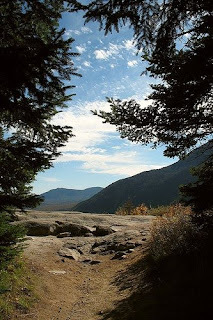 We haven't tried this yet, but one source calls it "the best view for the easiest hike" in the White Mountains. The hike is 3-miles round trip, with a gentle and steady climb to a wide open summit. Check out Hiking with Chuck's website for photos and all the details you need to plan your hike. This is a pleasant ride which is about 95 percent paved; only the last half mile or so is gravel. The trail welcomes non-motorized traffic and is busy with bicyclists, strollers, joggers, and in-line skaters, but not so busy that we felt crowded or rushed. It's a mostly wooded trail except for two ponds and some farm pastures and marshes. I especially like the section that feels air conditioned because it's cut between two high stones. Also of note are several stone walls and a granite arch bridge. According to the Rail Trail website, there's a cellar hole from an 1800s sawmill, but we missed it. That's okay, we'll find it next time. This was our second time on the trail, but it won't be our last! Directions: We started our ride by the train depot parking lot off Depot Road in Windham. Your best bet is to check the Windham Rail Trail website for more information and directions. 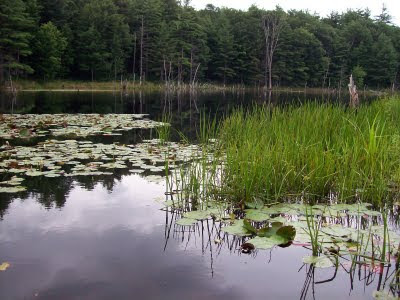 We kayaked a tried and true favorite today -- Gilmore Pond in Jaffrey, located in southwestern NH. I've written about Gilmore at least three times before, so I'll just add a few highlights from our paddle today. All I can say is that for us, the allure of this place never goes away. A Resident Loon (or two) -- Doug was within 30 feet of a loon today as it sat quietly near the bank. We weren't trying to encroach on this beautiful bird; it just appeared near us and didn't seem disturbed that we were so close. The black and white checkerboard pattern on the loon's back is a pretty cool gift from Mother Nature. A fellow paddler noted that he was amazed that the bird could stay submerged for so long. If you're curious about why, take a look at my earlier post about the Haunting Call of the Loon. Peace and Quiet -- Gilmore isn't remote, but it's peaceful. Many houses on the pond are tucked behind the trees and there are no main roads nearby. It's a no-wake pond, so that helps, too. We paddled around mid-morning on this hot and sunny day, so it was no surprise to see other people swimming, fishing, picking blueberries, and paddling. But we never feel crowded here and everyone seems to treat this place with quiet respect. You can get directions to Gilmore and read more about the crystal clear water and mountain views here. Enjoy!